Imagine here a clever tagline that draws you in. And then this would be the point at which there would be some sort of sales pitch to convince you to buy one or more, but preferably all, the books you see listed in the sidebar to the right. Unless the sidebar has been moved to the left side and no one noticed that this section needed to be changed to reflect that. But that all sounds like a lot of work. Ugh. Do you want the author working on writing sizzling sales copy or writing the book you want to read, because there could be an inverse relationship between the quality of the sales copy and the quality of the book, since the author can only focus on one thing or the other, so which should it be? While you ponder that rhetorical question, this copy just gets more and more inane. Do you like kittens? That’s cool. Kittens are pretty awesome. Unfortunately, no kittens appear in any of the first three books in the sidebar at right (or left). 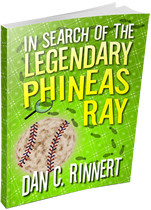 However, in the first book, In Search of the Legendary Phineas Ray, there is a cat. Full-grown. Not a kitten. Sorry. Mind you, the cat isn’t a major character in the book and the cat definitely does not talk, but a cat does make an appearance, so there is that. If it makes things easier, think of it as an overgrown kitten while reading it. Yay for kittens! Or, adult cats. Whatever. Do you like unicorns? Awesome. Because a unicorn does make a brief appearance. Like one scene. But a totally awesome scene. At least the author thinks so. Hopefully you will agree. If not, think of unicorns! Yay! Unicorns! The book is not about unicorns, so don’t get too excited. 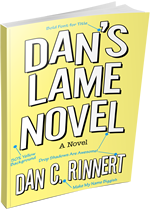 As for Dan’s Lame Novel, well, actually, it’s not really about anything. It just is. But, if you like tacos—or even if you don’t—you’ll be pretty perplexed over their inexplicable appearance in the book. Also, many rules of writing good fiction are ignored or tossed out the window completely. 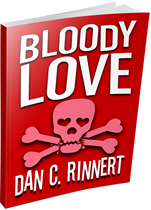 In contrast with Dan’s Lame Novel, the stories in Bloody Love are about something; namely, romances that end badly, which, to purists, means they aren’t romances at all, but for lack of a better way of explaining it, they are, more or less. They are simply romance stories that, rather than ending happily ever after, end not too happily at all. Well, some do kind of have happy endings for one member of the prospective couple but most definitely not for the other. Just don’t expect any to end with a happy couple moving into a beautiful Colonial home with a white picket fence, 2.5 children and a puppy. Now, with any luck (though history would inform us otherwise), you are probably feeling inclined to purchase one of those books. Just one. Not all three. Because they are so completely different from one another. Why would you want to buy and read all three? Maybe you don’t like romance stories that aren’t actually romance stories. Maybe you just like books that randomly toss in a unicorn for no reason other than the fact that unicorns are pretty cool. Or maybe you don’t want to read a book with zombies. You just want to read a book that is pretty lame. So, you’re thinking to yourself, there’s no way you want to read all three. Well, you don’t want to miss out, do you? You see, at some point, a fourth book will come out. That some point has already occurred. And it’s Bad Fiction. In it, you’ll begin to see the connection between two of the three aforementioned books. Another future book will reveal the connection between all three. And so on. And things will keep churning along and you’ll see how things all tie together and you’ll be like, Wow! I can’t believe I almost missed out on all this! So, don’t be the one at your impromptu office water cooler book club that is missing out! Buy all four! Read all four! Then be “in the know” when future books come out. There’s now a fifth book book out but not the aforementioned fifth book because, while it is a fifth book, this one is nonfiction and does nothing to tie any of the fiction ones together so sorry about that. But I need mention it to fill out this space. 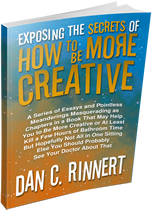 If you want to be more creative, this fifth book, titled Exposing the Secrets of How to Be More Creative, may be the book for you because it matches a keyword search for creative, creativity and possibly how not to write a book dedication. If you are an author, this is the book for you. If you are a painter, this is the book for you. If you are in a career that could benefit by having more creativity, this is the book for you. If you need something to read while answering the call of Mother Nature, this is the book for you. Now, in continuing the endeavor to make sure there is not excessive white space in this area created by the addition of more books to the sidebar, it becomes necessary to find ways to fill out the text in this area which can be done by continuing to ramble on about nothing. One might also list potential hamburger topics and condiments such as ketchup, mustard, barbecue sauce, tartar sauce, Thousand Island dressing, mayonnaise, cheese, mustard, pickles, banana peppers, jalapeño peppers, black olives, green olives, bacon, lettuce, tomato, onion, fish sticks, mushrooms, avocado, guacamole, onion rings, fried eggs, chili, pineapple, Worcestershire sauce, chipotle sauce, anchovies, salsa, spinach, cucumbers, salami, pastrami, cilantro, pesto, apple slices, sriracha sauce, garlic, alfalfa sprouts, green pepper, green onion and many more! That was actually a trick learned in high school for responding to essay questions. Our teacher didn’t like essay answers that were brief and to the point. So some students (not me) padded their essays with lists such as a list of burger ingredients. It was quite some time before the teacher even noticed. Pretty sad. Oh well. I did it once. On one assignment, after answering the essay question, I had two blank lines to fill so I wrote in that space something along the lines of: I have two blank lines to fill so I am going to fill them by writing about having two blank lines to fill and there’s a little more space so I need to keep going. This was after the list trick had been exposed so I did it as a joke figuring he might find it amusing. Nope. Instead, he complimented me on my thorough essay answer. At first, I thought he was joking, that he had realized what I had done. Nope. So, that’s where I learned this trick I continue to this day. Not that you cared, but it managed to fill out the rest of the page as I had planned. I guess I did learn something in school after all. Phineas Ray was, perhaps, the greatest baseball player who ever lived. That’s because they never wanted you to remember. But things don’t always go as they planned. 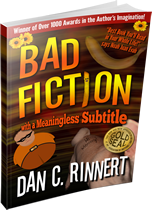 Authors usually don’t set out to write a bad novel. Neither did I. Instead, I elected to write a completely lame novel. A collection of four romance short stories, none of which end well. In good fiction, the protagonists would achieve their goals and live happily ever after. Bummer for them. A series of essays and pointless meanderings masquerading as chapters in a book that may help you to be more creative or at least kill a few hours of bathroom time but hopefully not all in one sitting else you should probably see your doctor about that. Curious about the best reading order for maximum enjoyment? Need more stuff like what you see here? 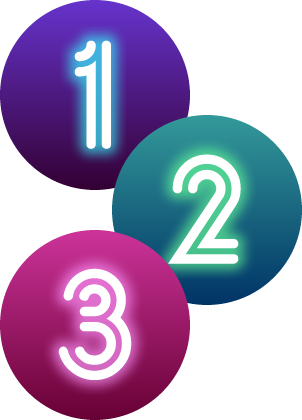 Subscribe to my list today!